Black Friday is here, so I decided it was the perfect time to kick off our Holiday Gift Guide series. I am so excited to share some of our favorite picks this year for girls, ages 2-3. 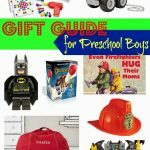 Christmas shopping for kids this age is so much fun because they love just about anything. 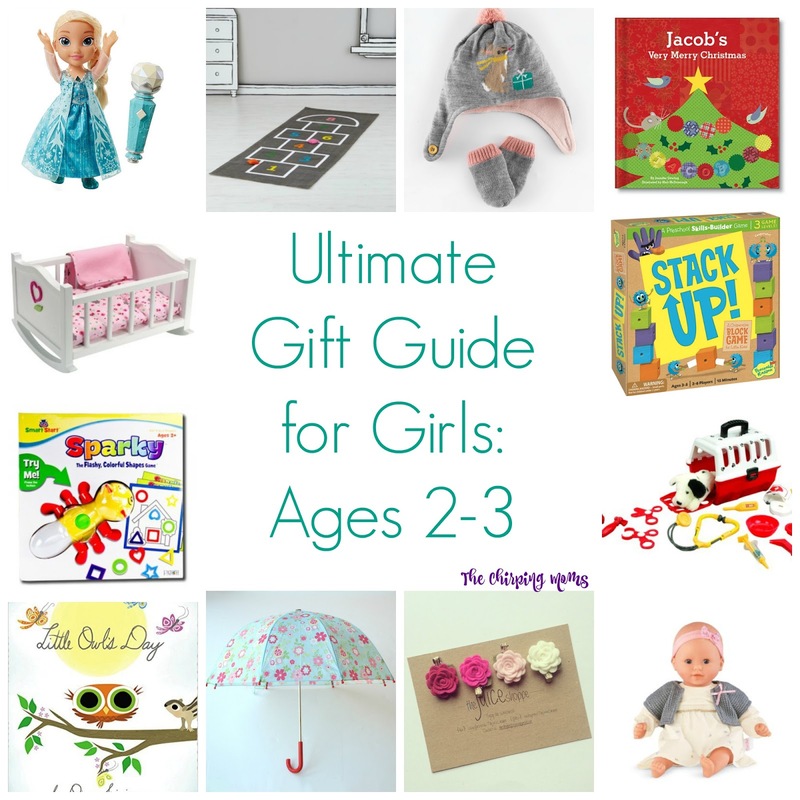 Below are some great gift ideas for girls. I’m not buying Abby everything that is featured below, but this list was created based on a mix of items that we are purchasing for Christmas, items that she owns already (and loves), & other items that I think would make great gifts! We hope you enjoy our Ultimate Gift Guide for Girls: Ages 2-3. 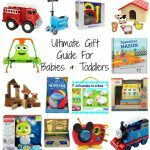 Hop, Skip, and a Jump Playmat: This is one gift that I am super excited to give Abby this holiday season. This fun hopscotch rug from Land of Nod is sure to keep her (& her brothers) busy inside during these long winter days! Frozen Sing-A-Long Elsa Doll: We are just starting to enter into the princess stage, with of course her favorite characters being Elsa & Anna. This sing-a-long Elsa doll, from Jakks Pacific, uses a real working microphone so the kids can sing the “Let it Go” song with Elsa. A great gift for any Frozen lover! Frozen Singing Anna Doll: And if you have singing Elsa, you better have a singing Anna too. This Anna doll, from Mattel, will sing “For the First Time in Forever” when you push the button on her necklace. Another great gift for any Frozen lover! Dalmation Vet Kit: Abby loves our dogs so when I saw this adorable Dalmatian Vet Kit from Battat, I knew it would be a hit this Christmas. Each set includes a puppy dog, stethoscope, tongs, & several other pieces. Now, she can finally have a turn taking care of her own puppy! Baby Doll: Abby is all about her dolls, so of course we want to surprise her with a new baby! I’m a huge fan of Corolle dolls as they are beautiful, timeless, & will grow with your child. I also love how all Corolle dolls have a slight vanilla scent. I’m excited to give Abby this doll that is all dressed up for Christmas! 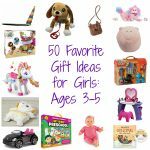 Doll Cradle: This year, we decided it was time to buy Abby a few doll accessories since she is really starting to get into imaginative play & wanting to be just like mommy. This cradle from Corolle is so sweet & fun for little girls. The cradle comes with a bunny print mattress and blanket so she can read books & rock her babies to sleep. Baby Doctor Set: This is a fun little set, again from Corolle that encourages your child to pretend to be a doctor. It comes with a stethoscope, dropper bottle, syringe, & more all in a carry-all bag. A simple, but fun, toy for girls! Doll High Chair: I love the hot pink color of this high chair from Corolle. It is actually a high chair that also converts into a desk and chair set. It’s a great addition to Abby’s new doll accessories this year! Glitter Shoes: Abby really wants some glitter princess shoes. Instead of buying her a toy pair, I decided to spend a little more & get her some glitter everyday shoes from Umi. These shoes with their silver glitter are perfect for any little princess! Hip Hop Plush Bunny: Stuffed animals are always a hit in our house & I thought this sweet bunny from Zutano would be a great sweet addition under the tree. So soft & so cute! Playhouse Ice Cream Truck: This is the most adorable “playhouse” ice cream truck for kids from created by OTO. I know my kids, especially Abby, would have a blast serving ice cream all year long in her playroom. Play-Doh My Little Pony Make ‘n Style Ponies: Abby is all about My Little Pony this year so I thought this fun set from Play-Doh would be perfect. Play-doh is one of her favorite things to do while I am cooking dinner & this set will be a great addition to our Play-doh collection. Crayola Marker Tower: I try to update our art supplies each holiday so this year, I thought a new set of markers would be perfect. I love the Pip-Squeak markers for small hands as they are thicker and easier for little hands to hold. Paw Patroller: This is one item that Abby would love to have. She is a huge Paw Patrol fan & I have a feeling that this would provide hours of entertainment! Seesaw: I also like to update our outdoor toys during holidays or birthdays. I thought this seesaw would be great for our new backyard and offer another fun opportunity for the kids to play together! Stack Up Game! : I’m always looking for games that keep both Abby & my older ones entertained. Stack Up! looks like a great addition to our game closet. It’s an award winning game from Peaceable Kingdom that consists of tower building where players work together to stack blocks. Kids learn color matching & work on hand eye coordination while having fun. Sparky Board Game: Sparky is an interactive game that teaches colors and shapes! This game, created by Patch Products, is both fun and educational. Sparky lights up a color and says a shape while kids find that and match it to their cards. 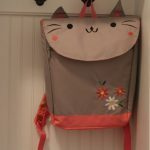 I thought this is perfect for our budding preschool Abby as she is working on learning her colors and shapes. Sticker Fun! 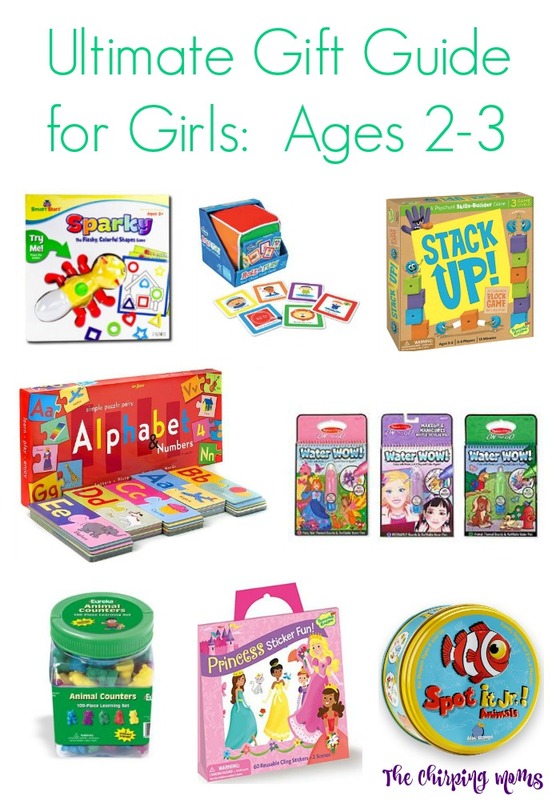 Reusable Princess Stickers: Reusable stickers are a favorite in this house because there is no wrong place to put them & kids can use them over and over again. 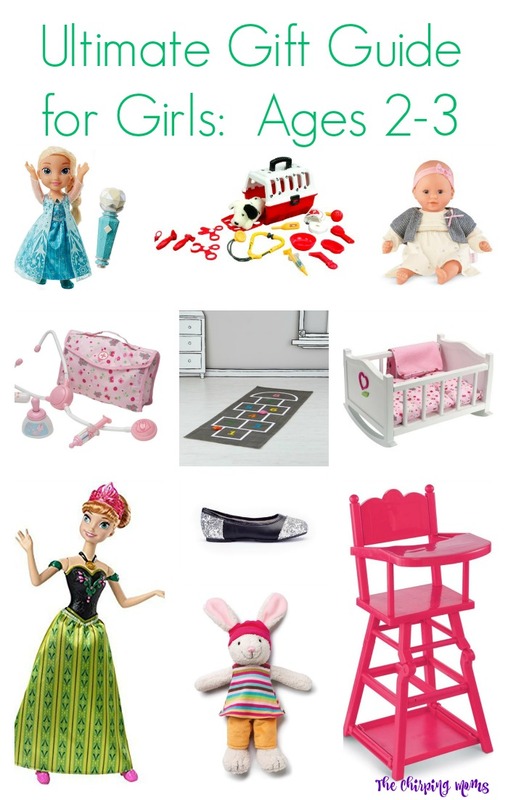 This princess set from Peaceable Kingdom looks like lots of fun for a little girl. We love that this set comes with a handled tote that makes it easy to carry around & is a great way for Abby to have fun on their own. eeboo Alphabet & number Puzzle Pairs: eeboo games are always a hit in our house because they are beautifully created and educational. In this game, children will match simple puzzle pairs using whimsical images as clues. I added this matching set to the set because it is a perfect learning tool for kids who are learning their alphabet and numbers. Spot It Junior Animals: This is great for little ones with older siblings because it is a game that all kids can enjoy! It’s a great game for on-the-go and for fun at home. Tub of Animal Counters: This tub is so simple, but wonderful for teaching and playing. These counters are perfect for teaching counting, sorting, hand-eye coordination, but also lots of fun for hours of imaginative play. 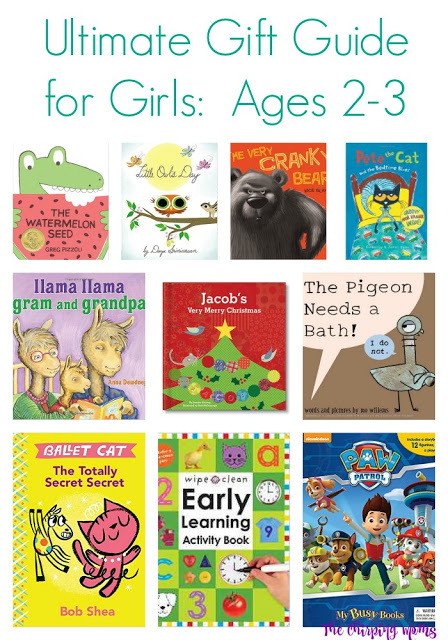 Water WOW Bundle: These Water WOW books are perfect for kids, especially when you are on the go. Each book comes with a refillable water pen that you use to color the reusable pages. Each page is white when dry, but filled with color when wet. These are a hit in our house & I often purchase a new set after a full year of use of these Water WOW books. 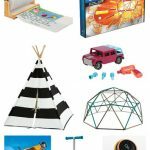 Thinkfun Roll & Play Board Game: This is a game that is sure to be a hit with younger ones. It encourages creativity, active play, & gross motor skills and is simple to understand and play with young children. This game is a hit in our house & my older kids love to play this with Abby! My Very Merry Christmas: I always love to buy one special book each holiday season for each kid. This year, I chose to get Abby this personalized book from I See Me. This story features Goose, Chipmunk, and other furry friends who deliver a note about your child to Santa. At the end of this adorable story, the animals circle the tree tha tthye have adorned with your child’s name spelled out on the ornaments. It’s a book that is created just for your child & a holiday book to cherish in years to come! Cat Dress: Abby loves cats so when I saw this adorable dress for Zutano, I knew this was one to have. 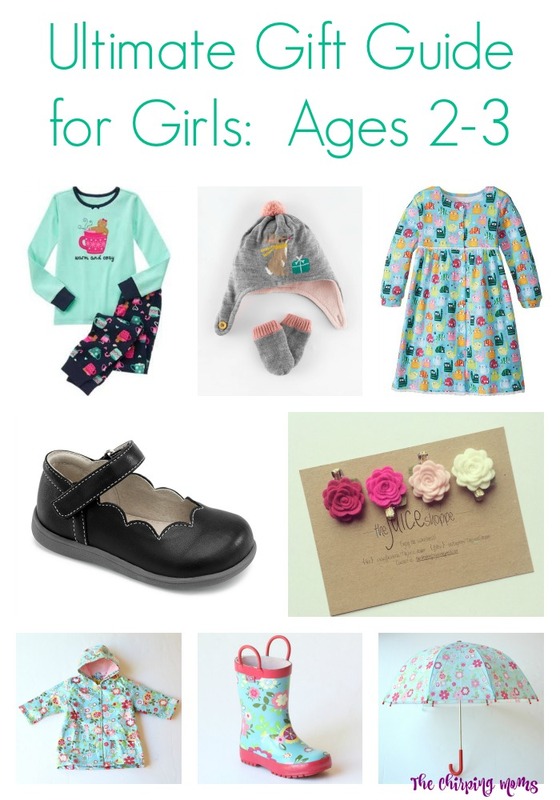 Zutano is one of my favorite brands for kids because their clothes are just so cute! Winter Hats & Mitten Set: We usually spend the month of December scrambling for whatever mittens & hats that we can come up with, so a great gift for Christmas is a hat & mittens set. I love this sweet adorable set from Boden. Rain Boots, Rain Jacket, & Umbrella: Abby has been asking for rain boots and an umbrella just like her brothers have so I decided that this year would be a perfect time to get her own rain gear. I love this Pluie Pluie matching trio from Babychelle for girls. I love that the rain jacket is lined for colder days, but it is also available unlined as well. I know this will be one of her favorite gifts this holiday season! Dress Shoes: Each year, it’s nice to get a new pair of dress shoes & these simple but sweet shoes from See Kai Run are a great pick for the new year. The classic black goes with about any outfit & again, I often buy on the bigger side so I know that it will last for a long time! Pajamas: We love to give the kids a new pair of pajamas on Christmas Eve, along with cocoa & a family board game to play together before going to bed. This year, I got Abby an adorable set from Gymboree that matches her big brother! Hair Accessories: Last, but not least, I am always looking for some new fun hair accessories for girls. Courtney told me about this fun new shop that she found, The Juice Shoppe, & I found lots of beautiful new bows and headbands for Abby for the next year! Disclosure: This post does include affiliate links & I did receive some of these items to review, but as always, all opinions are my own. i also ordered the vet kit!i think its is the best gift here!these ideas are great!